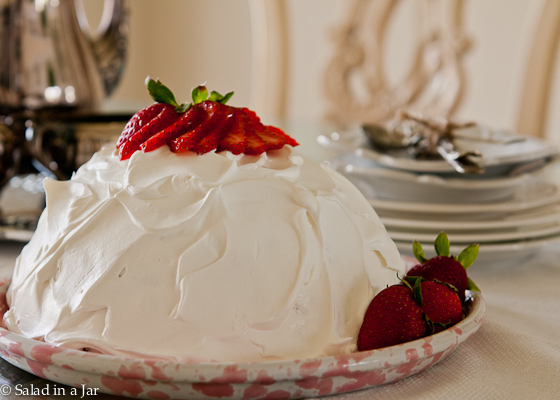 If your angel food cake didn’t rise very high, this Strawberry Snowball Cake is the perfect make-over solution. Must be made in advance, then chilled. Making an angel food cake from scratch is an exercise in anxiety management for me. Will it rise to the top of the pan? Will the volume hold after I pull it out of the oven? Luckily, I have the perfect solution if it doesn’t. 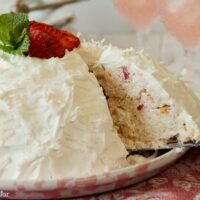 This Strawberry Snowball Cake (not to be confused with the pink fluffy concoctions you see next to the Twinkies at the grocery store) is a light and summery dessert full of fresh fruit, angel food cake torn into bite-sized pieces, and whipped cream. I’ve been making it for years, for several very good reasons. This dessert can be, and actually must be made ahead so it can be chilled before serving. In addition to pineapple, you can try adding different fresh fruits. My favorite is strawberries, but I can imagine that blueberries, peaches, or cherries would be tasty and colorful. 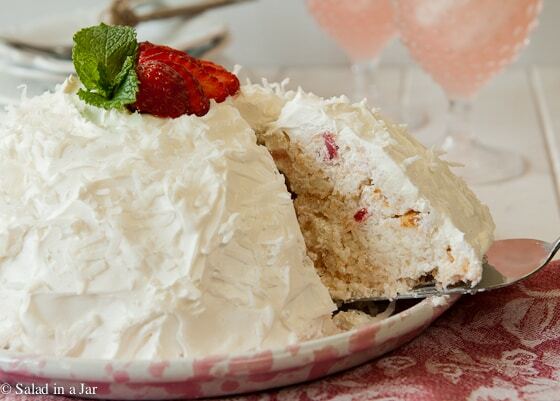 Use a store-bought angel food cake, a mix, or make your own cake from scratch. Although delicious with real whipped cream, whipped topping sold in the freezer section holds up better overnight. Coconut on the outside is not required but then it won’t look like a snowball unless coconut is used. This recipe is easy to cut in half–and I recommend it. Just use a smaller mixing bowl when assembling. In fact, the cake you see in the pictures is a half-batch that will easily feed 8 people. 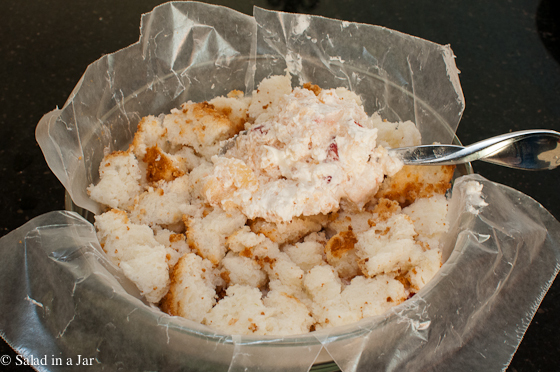 Make layers with the fruity gelatin and torn angel food cake in a wax paper or plastic wrap-lined mixing bowl. Sprinkle gelatin over cold water and allow to dissolve. Add boiling water, pineapple juice, sugar, lemon juice, and strawberries and stir to combine. Refrigerate until slightly jelled and gently fold in whipped topping. Tear angel food cake into bite-sized pieces. Line a 4-quart mixing bowl with plastic wrap or criss-cross 2 long and narrow pieces of wax paper over the bottom of the bowl. Then start with a handful of angel food cake pieces as your first layer. Now add a layer of the gelatin/fruit mixture, then another layer of angel food cake. Alternate layers until all is used. It's a good idea to push the cake pieces against the side as you build your cake so it will hold together and have a firm base for the whipped topping later on. The next day, turn cake out onto a cake plate with the help of the plastic wrap or wax paper. Remove the wrap and frost with the second container of whipped topping. Decorate with flaked coconut for a "snowball" effect. Previous Post: « What Happens If I Add Extras to My Jars of Lettuce? I made this for a July 4th family picnic today and it’s wonderful. What a great EASY way to make dessert for a crowd. I can see how you could add other fruits and flavors too. And, drizzle a piece with chocolate or fudge sauce – just to make it even better! Thanks. This sound wonderful. Can not wait to make it for Sunday. Do you mix the 20 ounce can of pineapple with the gelatin fruit mixture? Thanks for a scruptions blog and the ideal to cut the recipe in half. Yes, Connie. The pineapple goes into the gelatin with the other fruit. Wow, Paula – looks so…. pretty! And very yummy! Paula, that looks just perfect for summer……….must try making half a recipe! You’d almost wish for an unsuccesful angel cake if you’ve got this as a back up plan! I’m wondering if a person doesn’t like coconut (I do but there are “those people” out there that don’t if shaved white choc could give it the snowball look??? I’ve never made an angel food cake yet. Love this solution if it does not rise enough. Looks scrumptious. Haven’t made this in ages–thanks for reminding me! Yes, it is the perfect summer dessert. LIght. Fruity. Delicious. ohhh la la! looks so delicious! Watching these makes me hungry.. I’m gonna try this soon. What a wonderful way to salvage a less-than-perfect cake. I’m putting this aside for a future cake mishap. Typically, I’d cut it up in cubes and make a trifle.